Birthday is a special time for everyone and what most of the children (or adults) want is a birthday party! 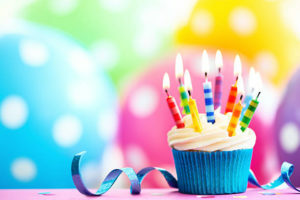 Lakeside is here to offer many options for your birthday swietie that wishes to celebrate. 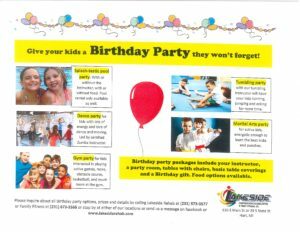 Please review information below, pick and choose and don’t forget to call (231) 873-3577 to ask for a party coordinator to answer any of your questions and help you through the booking. Leave the rest to us to organize, set-up and get the party started! Leave the most work to us and you just enjoy the party. Your Lakeside’s dedicated party coordinator will make sure that room is set up with tables and chairs requested by you beforehand. Get a 50 minutes of instructor time for your birthday child/person and guests to enjoy on activity of your choice (either Tumbling, Dancing, Gym activities, Martial Arts or Kids Yoga). After instructed time is up, you have another hour to sit down, eat and open the presents. Option to have 1 hour of food and opening presents followed by instructed time is also available. Food includes either pizza or sandwiches, drinks picked from the menu. It doesn’t include birthday cake. Arrival 15 minutes before the party starting and 15 minutes of clean up time is included in the package. This party package is perfect for you if you wish to bring your own food, drinks and cake or decide not to offer food at your party. Our Lakeside’s Party Coordinator will prepare the tables, chairs and room for you and your guests to gather in and gym floor with the instructor of your choice. Party package includes 2 hour room rental with 50 minutes of instructor time within, additional 15 minutes beforehand to meet and greet the guests and 15 minutes clean up time. Your Party Coordinator will be present during entire party for additional assistance. This party package is perfect for you if you wish to book the large space to host your child’s birthday party in, you have your own games, activities planned with the guests, but need the actual gym because of weather outside being unpredictable. Our Lakeside’s Party Coordinator will set up gathering room for you with tables and chairs as requested and arrange delivery of food chosen by you from the menu. You are welcome to use the gym floor space (open floor space, not the workout area) for letting the kids run, play and have fun, but you are responsible for their supervision. You will have 2 hours of rental time that will include additional 15 minutes before the rental to gather, meet and greet your guests and 15 minutes after the rental time to clean-up. Your Party Coordinator will be present during your rental to assist with any additional requests. You will need to bring the birthday cake. Need large space to host your child’s birthday party in? Do you have your own games, gym activities planned but need the actual gym because of weather outside being unpredictable? Our Lakeside’s Party Coordinator will set up gathering room for you with tables and chairs as requested. You are welcome to use the gym floor space (open floor space, not the workout area) for letting the kids run, play and have fun, but you are responsible for their supervision. You will have 2 hours of rental time that will include additional 15 minutes to gather and 15 minutes of clean-up. Your Party Coordinator will be present during your rental to assist with any additional requests. Please click here to find out more details about our pool rental. $110.00 for 2 hour rental.